Without doubt the best hairdressers in Fleet. TONI&GUY opened on the High Street in Fleet in 2004. Our dedicated team of Stylists and Technicians are on hand for style advice and an extensive range of services. Members of our salon team have worked on catwalk shows with the International Artistic Team at huge events including London Fashion Week- emulating the ‘catwalk-to-client’ philosophy. We are dedicated to providing the highest standards in customer service winning national awards within TONI&GUY. 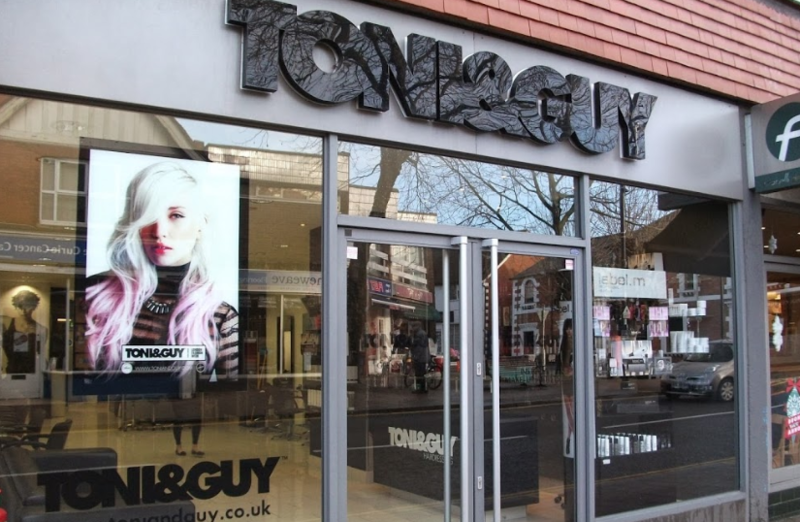 TONI&GUY hairdressers in Fleet offer many additional services such as bridal and occasion hair, Easilocks hair extensions and the semi-permanent blow-dry treatment; Nanokeratin. Robyn is friendly and a good listener. She does exactly what you want with your hair and I am always very hapywith the result. I am devastated that the salon is closing as there is no other within easy reach. Mostly I will miss Robyn. Thank you for the great hair cut! I am loving it! My regular stylist had left and so I was moved to Robyn. She understood my needs immediately and graded the ends of my bob so that it would sit up well. I loved it straight away and it is easy to manage. Sophie, as always, was bright and bubbly and a very good listener which I’d have thought all were essential qualities for a hair stylist?? The colour is just perfection, each time I think there is no way it will come out as good as the last but every time it’s better! Amazing!! Then I had my hair cut with Natalie who not only cut my hair to lift it but also to show off the colour better, and she understands how ruthless she needs to be when cutting into my hair, I’m like a yeti otherwise!! As always the salon was clean and tidy and all the staff are as friendly as they have always been. I have to add that I’ve been coming to the salon since February 2008 so I was shocked to hear of it closing, I get why, but it is a real shame, I hope they do something different with the space and that the equipment isn’t just tossed into a skip - I’m willing to take any products off your hands if the price is free for loyal customers....?! I want to wish them all lots of luck in their new adventures and thank you putting up with me for so long!! Another fantastic hair cut by Robyn, thank you!! Excellent haircut delivered with a lovely attitude! Sophie not only knows exactly how I like my hair but always has a smile on her face & great to talk to. Sophie was great. She nailed the colour I was after and we had a good natter as well. Think I’ve got the right Tash, really great haircut, so pleased. Tash is lovely, friendly and upbeat. A lovely visit. Very attentive . I went back to the salon after having my hair cut and coloured last week, as after washing it a couple of times myself I still felt that it was a bit too bulky at the back. Natasha was her usual cheery self and very quickly weeded out the area I mentioned without any fuss or questioning. Very happy with the result now and was even more happy when the trim was free of charge, I just love this salon and how well you’re treated from the minute you walk in, I’m one content bunny now thank you very much! !